I’ve spoken before about how I feel there are differences between soil health and soil fertility. If you refer back to week 2, I wrote a short post about it. This week I want to expand on the two topics and go further into depth about each. Knowing the differences, understanding the concepts, and implementing management strategies specific to your farm is what will set you apart and elevate the level of your farm's capabilities. A walk around your fields on a regular basis is also a great way to assess the indicators as well. I highly recommend to farmers on any scale to invest the time to walk fields with a notebook and a shovel. Yes, I realize technology has come along way from the days when I was scouting on foot and had nothing else but what I could fit in my backpack, however getting out and looking for yourself as often as possible beats any technology we have. On my uncle's farm, he has tracking devices for each cow. It’s a great system and aids him immensely. However, he still invests the time to monitor each animal in case the monitors aren’t functioning correctly for whatever reason. Technology should be used as another layer of management but does not replace the human element of seeing it for yourself. Color is one of the best field observations for OM. Soils higher in OM will have a darker appearance. On occasion, they will have an earthy smell to them as well. Structure, soil depth, infiltration, and water holding capacity are visible indicators. The soils ability to retain nutrients, water, and be a conducive environment for microbes is dependent on its soil structure. Balanced amounts of different pore spaces and a soil that is workable but not so lacking in stability it just crumbles like sand indicate a healthy soil structure. Often you hear some say your soil should resemble large curd cottage cheese. The depth of the soil is an indication of the plants’ potential to establish roots adequate for proper nutrient and moisture uptake and is a function of compaction and plow pan depths. When looking at soil in your field, you can often see plow lines in ground that has been overworked. Using minimal till farming systems ensure less disturbance aiding in healthy microbial populations and supplying adequate oxygen to support a balance of diverse communities. The chemical indicators include pH, which is directly related to biological and nutrient availability in the soil. Electrical conductivity is an indicator of overall plant growth response, microbial activity, and salt tolerances. A measure of plant available nitrogen (N), phosphorus (P), and potassium (K) is an indication of potential soil fertility and potential for N and P loss. Every one to three years you should have a laboratory soil test done for pH, OM, CEC, base saturation, macronutrients, and micronutrients tested. However, using a pH-electroconductivity meter in the interim is a good idea to monitor soil health in the field. Several meters on the market do an adequate job for field use. They run anywhere from $99-to several hundred dollars. If purchasing one is cost prohibitive, check with your local extension service. Often, extension or conservation district offices have equipment for farmers to borrow for field analysis. The biological health of the soil is indicated by everything from plant growth to the presence of the tiniest of microbe’s unseen to the naked eye and everything in between. Good field indications of a healthy microbial population are the presence of earthworms and in a grazing system Dung Beetles. Something you don’t hear of often, and I think overlooked. Ask any grazer that I’ve walked their fields; I’m usually ignoring them while picking through piles of poo. All though small in size they make up for it in function and usefulness. 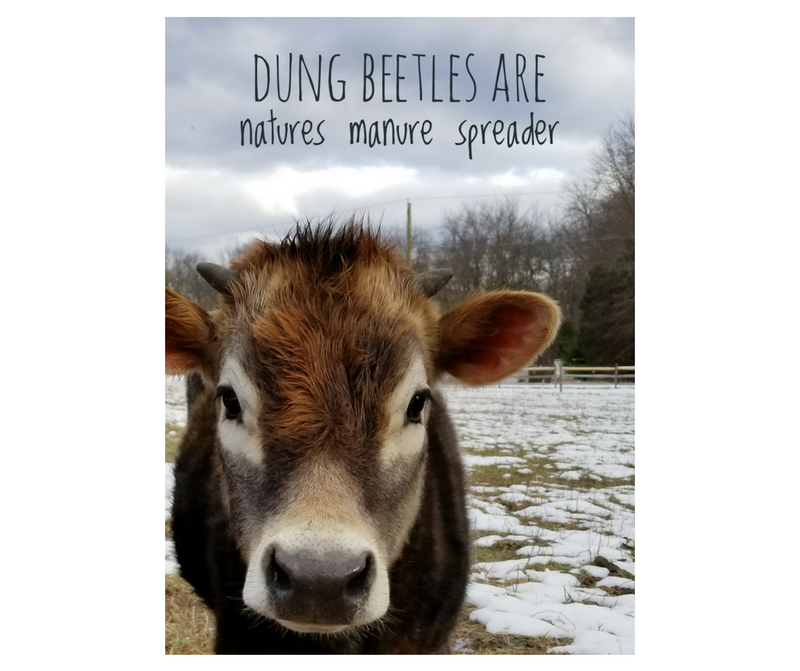 Dung Beetles are natures manure spreaders. An earthy smell is an indication of balanced microbial life as well. Where soil health can be assessed with field indicators, soil fertility is the quantitative measure of the signs earlier mentioned. Soil fertility is defined as the soils ability to supply essential nutrients to the plant. I’ll add that it should be done with sustainable economically minded practices and inputs that can be implemented by the farmer. The Cadillac of all farming systems and fertility programs are pointless if the farmer can’t pay for, comprehend, or implement them. The measure of soil fertility is done through several laboratory tests and indexes quantifying OM, physical characteristics, chemical characteristics, and quantifiable biological populations. I often get asked what laboratory test a grower should do and how often. The answer is not always as straightforward as one might think. It ultimately depends on the level at which you want to manage your specific farm and are the costs involved justified. Far too often I see farms using highly specialized tests and achieving the same results another grower did with consistently monitoring field indicators. Each test is another layer of management that needs to show enough return on investment to be feasible. The following tests are available nationwide. The following is not an exhausted list; it is a reference to tests I recommend or have used with growers. If you know of other, let me know. Each test comes with its pros and cons. If the level to which you manage your farm warrants the cost associated with each one then having the extra quantified information can be of value. Grab a shovel, get out and walk your fields. Consistent field monitoring with consistent and applicable testing are management strategies necessary to achieve soil health and manage soil fertility leading to a successful and profitable farm.